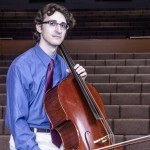 Cellist Taylor Skiff received his Bachelor of Music degree from the University of Wisconsin–Madison in 2013 and his Master of Music degree from The Juilliard School in 2015. Taylor’s past cello teachers include Timothy Eddy, Parry Karp, and Uri Vardi. He has also received instruction from cellists Eric Bartlett, Alban Gerhardt, Ralph Kirshbaum, Ronald Leonard, Amit Peled, and Peter Wiley. Taylor has been a featured soloist with multiple orchestras, including the Milwaukee Symphony Orchestra and the Wisconsin Chamber Orchestra, performing Ludwig van Beethoven’s Triple Concerto, Ernest Bloch’s Schelomo, Antonín Dvořák’s Cello Concerto, and Pyotr Ilyich Tchaikovsky’s Variations on a Rococo Theme. In addition to his solo playing, Taylor is an avid orchestral musician, and has performed several times at both Lincoln Center and Carnegie Hall. His most recent orchestral appointments include being the assistant principal cellist of the Dubuque Symphony Orchestra (2010-2011), co-principal and section cellist of The Juilliard Orchestra (2013-2015), and co-principal cellist of The Orchestra Now (2015-2016). During this time, Taylor worked with conductors James Bagwell, Leon Botstein, John DeMain, JoAnn Falletta, Alan Gilbert, Bernard Haitink, Vladimir Jurowski, Fabio Luisi, and Gerard Schwarz. Additionally, Taylor is the former cellist of the University of Wisconsin’s Perlman Piano Trio (2010-2013) and has been teaching the cello privately for over a decade. Let others know about Taylor Skiff. Did this teacher help you to learn? How long did you take lessons? Are you still playing music? Share any thoughts or stories you have so that others can know about this teacher!